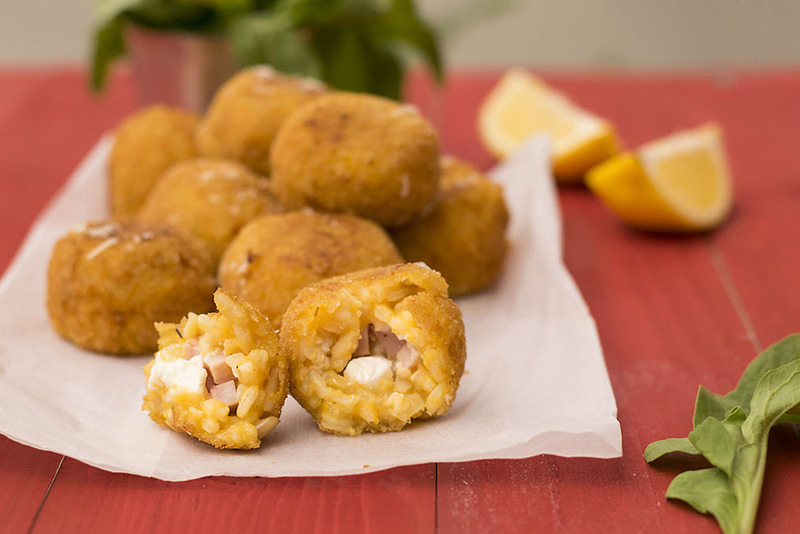 These butternut squash risotto arancini are filled with Greek feta cheese and Italian pancetta for the ultimate Mediterranean pleasure! These butternut squash arancini were made with the leftovers from my light & creamy butternut squash risotto with mushroom chips. My first thought was to use the mushroom chips for the filling, but I figured that they would probably lose their crispiness and to be honest, I much more preferred to snack on them since they’re so delicious on their own! (I would go as far to say that they’re even better than popcorn or potato chips, so make them the next time you watch your favorite movie from your couch). As a result, I decided to make a filling with some feta cheese and a few pieces of pancetta. Pancetta and feta cheese give these arancini an extra savory dimension, but you can also make them plain if you don’t feel like stuffing them. 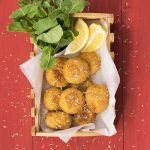 Arancini are an Italian delicacy made of risotto balls coated with breadcrumbs and then deep fried. I don’t know if it was due to necessity or creativity that this dish was created, but whatever the reason the fact is that they’re an interesting and tasty way to use leftover risotto. Though there have been times when I’ve eaten reheated risotto in the microwaves, everyone will tell you that risotto is best eaten the moment it’s prepared and once it gets cold, then it’s no good. There’s even a saying in Italian restaurants that goes something like “the risotto doesn’t wait for the customer, the customer waits for the risotto” meaning that you just can’t prepare it beforehand and warm it up when you get the order. Of course, you can make arancini with any risotto you may have left, including this lighter porcini mushroom risotto! Just have it cold and cover it with breadcrumbs. 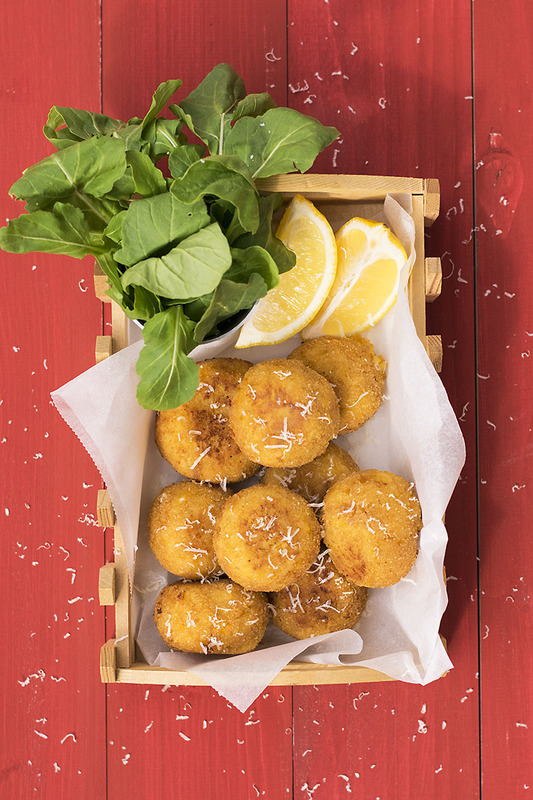 To get extra crispy on the outside, these arancini are coated with toast crumbs. If you can’t find readymade toast crumbs, just toast some bread slices and after they’ve cooled, process them in a food processor or put them in a zip log bag and crush them with a heavy object. I also followed the example from seriouseats and dipped the arancini in a slurry before coating them. This results in a perfect crispy-but-not-greasy texture! Some extra grated parmesan when making the risotto can help bind the mixture better. 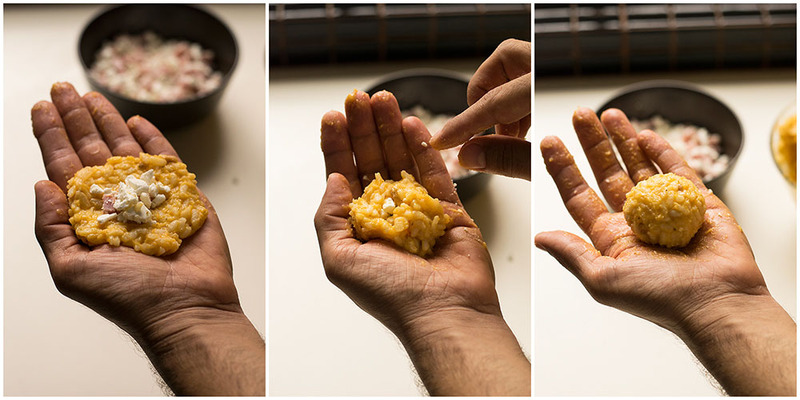 The mixture will be a little sticky, so rinse your hands every two or three arancini and keep them lightly wet. 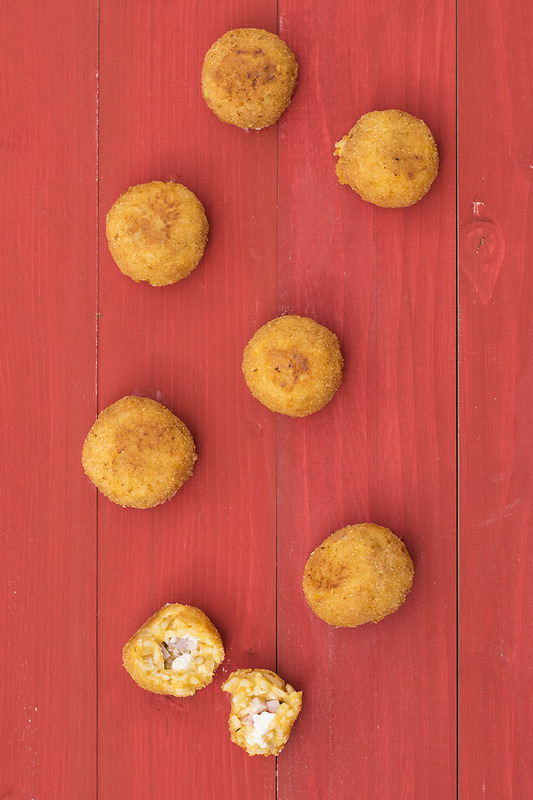 The rice balls should be the size of a small tangerine, or a little larger than a golf ball. After you form the balls, press firmly with your hands to compact them. Cool in the fridge for 15 minutes to firm them up. To reduce chances of the butternut squash arancini falling apart, you must not use too much filling and you must fry them quickly. So make sure that the frying oil is really hot, and cook them in small batches. Don’t move them around during frying. Just flip them once and remove when done. Transfer the feta and the pancetta into a bowl and mix well with a fork. Combine the flour and a few tablespoons of the water in a medium bowl until a thick paste is formed. Add the rest of the water gradually, until you get a smooth slurry. Place toast crumbs into a large plate. Wet your hands very lightly and take about 2 tablespoons risotto. Form a flat disk and put about half a tablespoon of filling in the center. Wrap the filling with the risotto and form a ball. Let the ball rest on a clean surface and continue until all the risotto is gone. Dip each rice ball in the slurry, let it drain and transfer to the plate with the crumbs. Cover well with the crumbs and transfer onto a plate. 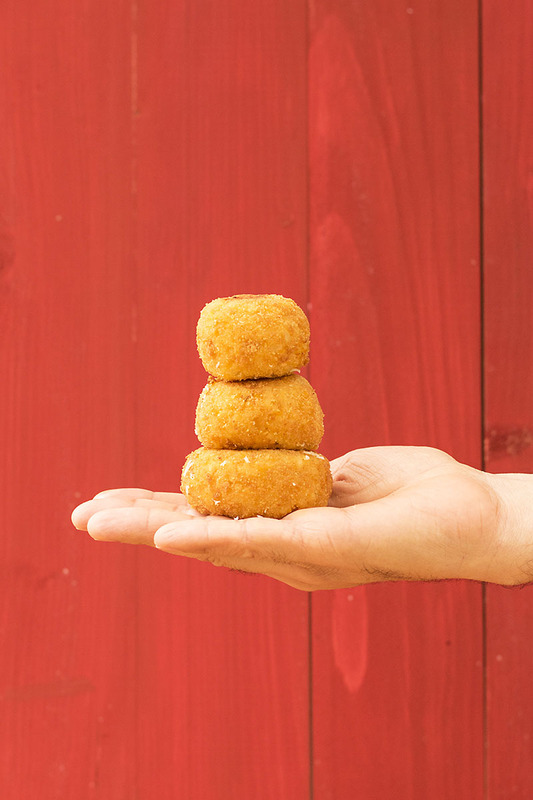 Continue with the rest of the arancini. 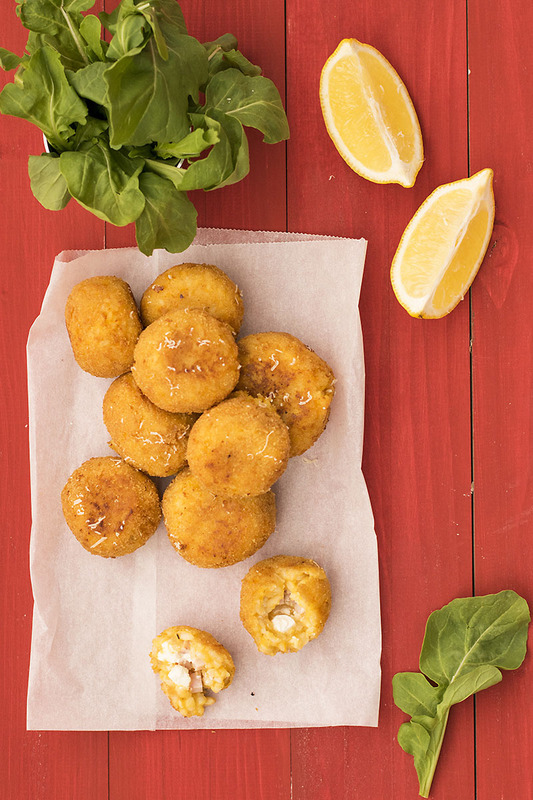 When done, place arancini in the fridge for 15 minutes to firm up. Fill a nonstick pan with vegetable oil, about 1.5 inches high, and heat very well. Fry arancini in batches, about 4-5 each batch so that the temperature of the oil doesn’t drop down very much. Cook for 2 minutes each side, flipping them gently with a slotted spatula. Remove with the spatula when golden brown and transfer to a paper towel to absorb the extra oil. Serve with lemon wedges and some arugula (rocket). You may want to add half a cup grated parmesan to your risotto when still warm, since this will help the balls hold their shape better. If you like this recipe,Pin it! What a great idea to use leftover risotto!! This looks so perfect..Crisp and golden, Yumm! Feta lovers are the best people, haha! Thanks Heather!